Posted in Brunch, on September 8th, 2015. 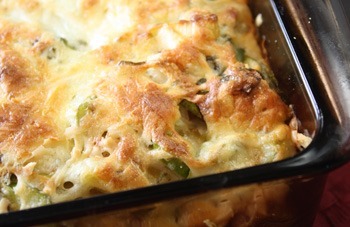 Tender, moist, cheesy, leek-filled and altogether lovely for a leisurely brunch. The other night I had house guests – Joe, Dave’s good friend, who still comes to stay periodically when he has business in my neck of the woods, and his wife, Yvette. We all attended a social shindig and they decided not to drive back home to San Diego. I was happy to accommodate them, even if my house was (still is) a bit of a mess from the remodeling. Preparing a brunch dish was fairly easy and straight forward. I’ve been going through stacks of recipe clippings (mostly from magazines over the last couple of years) and adding them to MasterCook (nearly all of them I’ve found online so it’s easy to click a couple of buttons and it’s added into my to-try file). This recipe popped up the other day and I thought it would be a nice dish to prepare for our leisurely Sunday morning breakfast/brunch when they were here. The recipe (that someone gave me, don’t know who!) started from one Georgeanne Brennan created. She made it when she was in France, and shared her version with the chefs at Chez Panisse in Berkeley but she even says in the recipe that you can substitute a variety of veggies and cheeses. I found several versions online, but this one had a bit more flavorful ingredients in it, so I worked with this one, adding or subtracting from the ingredient list as it suited what I had on hand. I had asparagus and leeks. Check. Eggs. Check. Ciabatta bread. Check. Fontina. Check. And Pecorino-Romano. Check. Everything else was a household staple. I made half of the below recipe, in an 8×8 glass dish. If you had really hungry guests, probably it would feed about 6. It didn’t take long to put together – this isn’t the type of brunch dish you have to soak overnight – 15-20 minutes with the milk on the bread was sufficient. You could – I’m certain – make this the night before, but don’t add the cheese on top until you put it into the oven, and I’d allow it to sit out at room temp for about 30 minutes before baking. It might take another 5 minutes of baking time too. You can vary the cheese – I used, as I mentioned above, Fontina and Pecorino-Romano, but Swiss cheese is mentioned in some recipes, and Emmental in others, so Gruyere would also work. Even Parmigiana-Reggiano would be fine too but not too much. And if you like a topping, I think this would be nice with some fresh tomato salsa. Or perhaps a mushroom sauce? However, the calorie count is fairly significant with this containing half and half and some cream, so think twice about using a calorie or fat-laden topping. That’s why I thought salsa would be a nice addition. I didn’t have any or I’d have served it with this. You can use your choice of herbs – I used what is currently in my garden (basil and rosemary) but use whatever suits you – chives, parsley, tarragon, thyme. 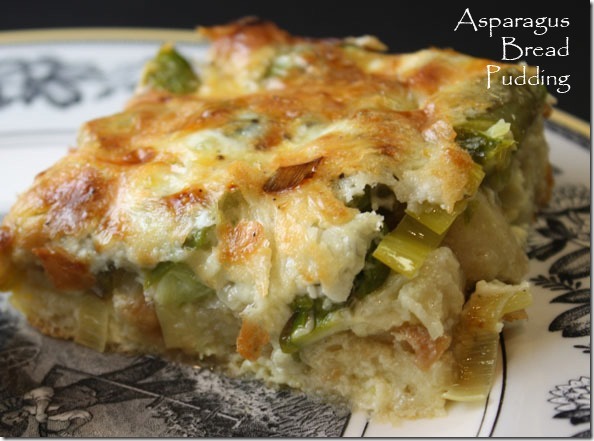 The leeks are cooked some, then the asparagus too. I cooked the asparagus stems first because they were rather robust in size, then added the more tender tops during the last minute. I used ciabatta bread – I cut it into small cubes and left them to sit out overnight in my kitchen, so they were certainly “stale” by that time. The casserole is baked for about 45-55 minutes, or until the top is nicely browned. Don’t over bake it or it will dry out. Let it sit for about 5 minutes before cutting and serving. I served it with fresh fruit, some pork sausage and Greek yogurt. What’s GOOD: I liked that it could be made just before baking and it was really nice. I might use more asparagus next time just because I like it. It was easy to make and looked very pretty on the plate. I might use a tiny bit more cheese next time – and I might try different kinds just because you can. If you make the 9×13 casserole, it would serve a big bunch of people. At least 12, maybe 14. What’s NOT: nothing at all. 1. Grease the bottom of the dish you’re using (9×13 works, or similar 4-quart dish as long as it has 2″ high sides). Place bread in a large bowl. 2. Mix half and half, cream, eggs, cayenne, lemon zest, salt and pepper until there are no streaks of egg yolk. Pour HALF of milk mixture over the bread and let sit for 15-20 minutes. Reserve remaining milk mixture. 3. While bread is soaking, trim leeks, and chop well. Saute leeks in butter for 1-2 minutes, then add water and steam (covered) until leeks are cooked through, 5-7 minutes. Remove leeks to the bowl leaving any fluid in the pan. Prep the asparagus: trim off woody ends and chop into 1/2 inch pieces. Add the asparagus to the pan and cook briefly, about 1-2 minutes, then add the asparagus to the bowl. Discard any remaining fluid in the pan. 4, Preheat oven to 350°F. 5. Sprinkle herbs over the bread mixture, then add about half the cheese and stir this mixture around so it’s evenly distributed. Pour it all into the prepared baking dish and then pour remaining milk mixture over the top. Add the last of the grated cheese evenly on top. 6. Bake until top is crusty brown and a knife inserted in the middle comes out clean, about 45 minutes. Allow to sit for about 5 minutes before cutting into squares to serve. Per Serving: 454 Calories; 19g Fat (38.2% calories from fat); 15g Protein; 55g Carbohydrate; 3g Dietary Fiber; 135mg Cholesterol; 824mg Sodium. The lemon zest is an interesting addition. I think I would have to cut back on the high-fat dairy, maybe use whole milk and half and half instead of half and half and cream, but I’ve been on the lookout for an appealing breakfast casserole for when the family comes over. I like ciabatta bread in this sort of thing–it doesn’t turn to mush but retains substantial chewiness. That sounds heavenly, I love anything with custard, sweet or savoury. Georgeanne Brennan is a friend and has nothing to do with Brennan’s in New Orleans, and never did. She writes cookbooks by herself and under assignment from Williams-Sonoma for decades, and lives in Northern California 45 minutes from my house in farm land.